Hurricane Katrina marked a dark turning point in American history and a point at which America lost the respect it had always held, as the world looked on in absolute disbelief that the richest and most powerful country in the world would leave its own citizens helpless – despite their pleas. It will also be marked in history for the typically New Orleans spirit – during, after and in rebuilding – and the stories that even now move one’s heart. 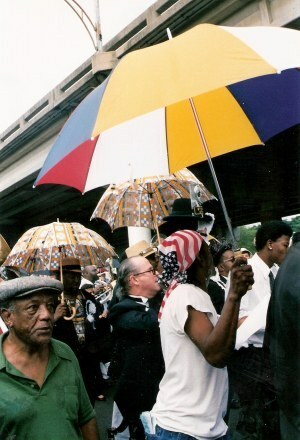 It seems fitting then, that the citizens of New Orleans should give their highest honour and mark of respect – a Jazz Funeral with a symbolic empty coffin, held on August 29, 2006 – to honour the 1,700 lives lost in Mississippi and Louisiana as a result of Hurricane Katrina. I had the great privilege to live in New Orleans for two years prior to the hurricane, working with the vibrant business and artistic community to develop the New Orleans Film and Music Strategy. My apartment was a loft in the Old Cotton Mill, exactly halfway between the two buildings featured in the TV documentary of those dreadful days. During my happy time of residence, there were just a few Jazz Funerals drawing us all to participate. 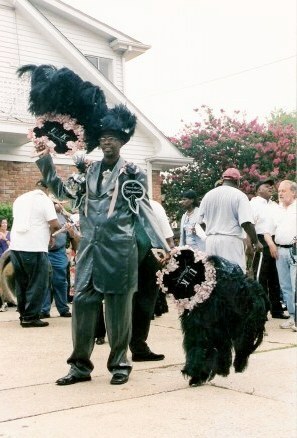 If you have no idea what a Jazz funeral is like - well watch this video of the second line. 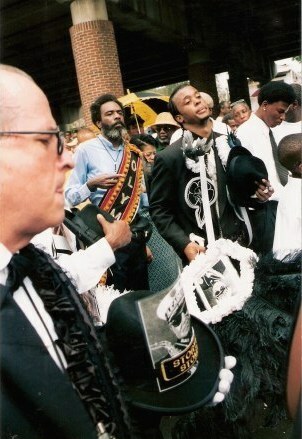 (I have led a second line in the Warehouse District - but it wasn't at a Funeral. 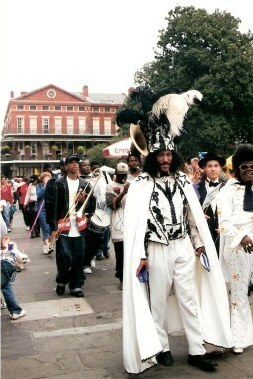 A New Orleans 'Second-Line - the group that dances follwing the band and the 'Main Line' of organisers - may be held to celebrate any event people think deserves the celebration. This second line for which I was passed the parasol from its leader, was for the opening of the Warehouse District art nights. A work colleague who knew me only professionally, said she couldn't believe this was the same person. Work hard, live well, and dance - it's not a bad motto for life! Sadly, soon to follow from the jazz funeral shown here, there were two others: for Ernie K Doe, self-proclaimed Emperor of the World. The same Ernie K. Doe of the (in)famous Mother-In-Law’s Lounge...Mother-in-Law's Lounge New Orleans (now operated by Kermit Ruffins). 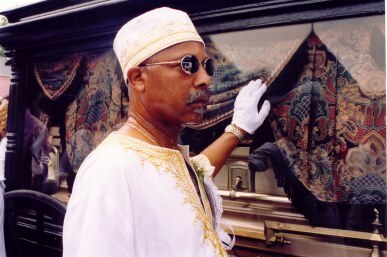 The second jazz funeral was for Snooks Elgin – two real characters of New Orleans. 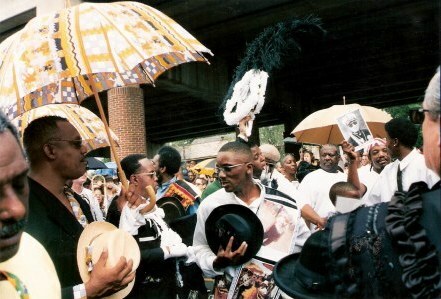 The New Orleans Jazz Funeral starts with the funeral service, attended by friends and family -while those not close to the deceased gather around the church: residents of the city who want to show respect, and photographers from around the world, plus TV crews and amateur photographers. There is a festive air in the heat and humidity… for what we are doing is celebrating a life lived, not the death. 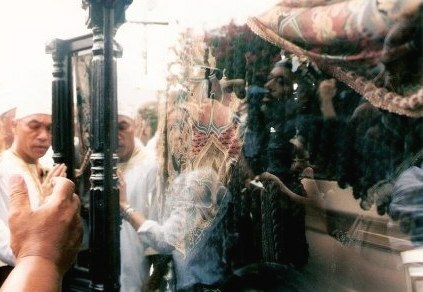 There is also a sense of deep respect for the mourners and the one who has passed on. 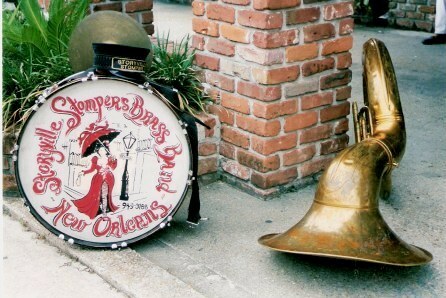 …along with the Brass Band musicians, who chatted to reporters given the task of capturing the unique mix of music and dance that marks a New Orleans send off to a better world. Not all those doing the interviews were adults. 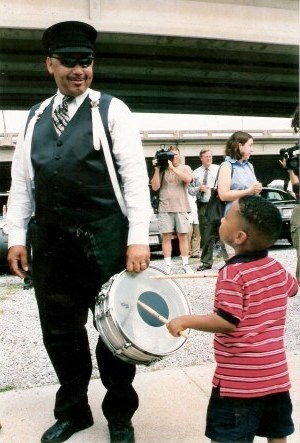 This young lad was fascinated by the drums and as usual, the youngster was encouraged to 'have a try'. With his enthusiastic beat, he made what some Christian hymns call 'a beautiful noise' - and brought smiles to many faces with his absolute delight in doing so! 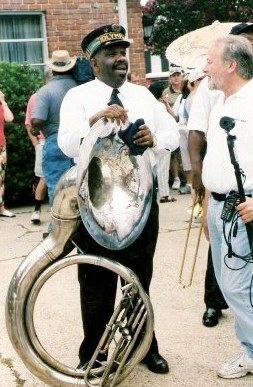 This is New Orleans music today, second line music. Music that combines jazz, gospel, blues, R&B and funk with a nod to the past and a wink to the future. This music celebrates life as it is defined by the citizens of this amazing city. Close by, members of the New Orleans Indians also waited. As usual there were many requests for photos. …as they chatted with other Indians. In the New Orleans Mardi Gras Parade, historically, the poor blacks of the community didn’t have a place: it was for the wealthy. The way to solve that problem was to form their own Mardi Gras Carnival Krewes - with Indian “tribes” of their own classification. Why Indians? It was often the Native Americans who helped the slaves escape and gave them safe haven –a level of risk and assistance that has never been forgotten by the black community. The New Orleans Indians are named after mythical Indian tribes relating to the neighbourhoods – and each has its Big Chief. 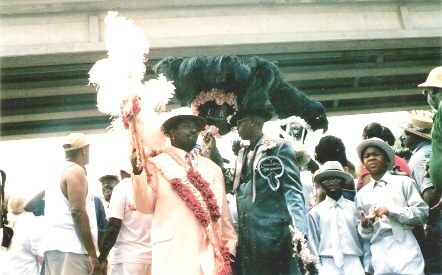 The Indians’ Parade is the greatest Mardi Gras secret, for unlike the other parades of the Mardi Gras season, this one has no published date, time or venue – being the result of the seemingly spontaneous decisions of the Big Chiefs. The costuming is wonderfully extravagant and the tribes are fiercely competitive to outdo the flamboyance of the others. Here, for the Jazz Funeral, they were dressed not in the flamboyance of Mardi Gras costumes that take uncounted hours and cost to create in a competition to outdo the other “tribes” – but in their conservative (!) suits of rainbow hues. 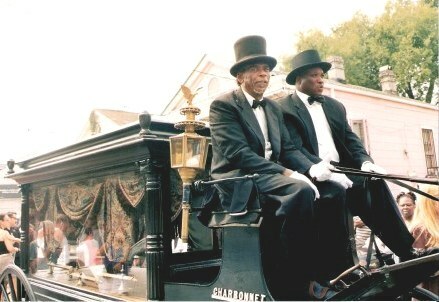 They fell in behind the horse-drawn hearse as the casket was carried from the church to be transported to the cemetery. The procession started slowly, with sombre and mournful tunes. We were all just escorting the funeral to the cemetery where the family had asked for the privacy of their friends and relations as the body was interred. 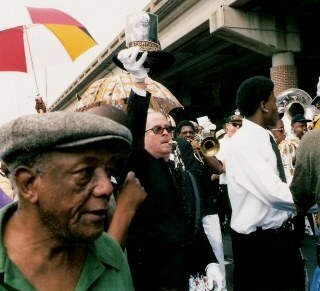 Once the minister has blessed the grave, the return procession breaks into uplifting, toe-tapping, New Orleans music – not always jazz but always typically N’awlins music - designed to celebrate the life lived and its impact on those left behind. Coloured parasols twirl, hankies wave and the crowd falls in behind the Second Line leader in a wild exuberant procession back to the wake. It creates an infectious lifting of the soul and it is impossible NOT to dance along. 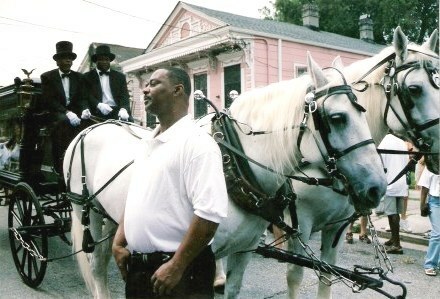 I had the honour of having the lead of a second line passed to mein the Warehouse District. 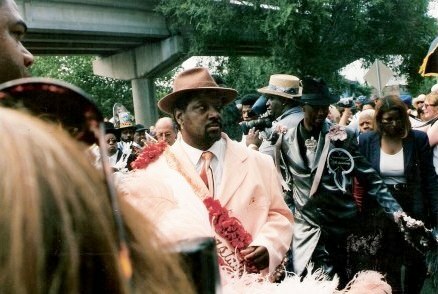 It was not a funeral - just a 'Nawlins' procession. Afterwards, a business colleague who knew me in more formal environments rushed over to express her total amazement at this “other side” of my personality – for it takes a dedicated and fit dancer to truly express the feelings of the moment in tune to the brass-band music! Movement began at the signal from the band leader – blowing his whistle and lifting high the photo of the deceased musician. …replicas of which were also held aloft by many mourners - as if his friends were together raising his spirit here, for the last time on earth. Off we all set - mourners beside the hearse. …and showing their obvious loss at a fellow musician and friend. They were followed by others in the community, with their parasols and handkerchiefs - dancing slowly to the mournful tunes. For some, the procession was too great an endorsement of their grief. They paused beneath the elevated highway under which the procession slowly filled the streets, friends throwing arms around them, comforting them and sharing their sorrow. Not how did he die,but how did he live? Not what did he gain,but what did he give? These are the units to measure his worth, regardless of birth. These words by that great poet and pundit Anon say it all. 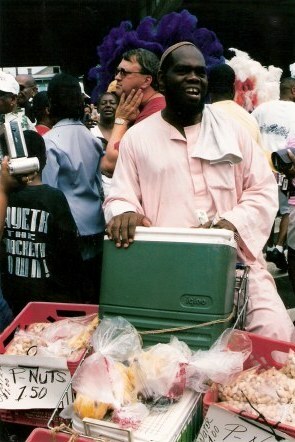 It would be unusual in New Orleans, where music fills your life, that it should not also be a part of death.